Verve Sneak Peeks are here! : Happy Days! The Verve sneak peeks have begun and Julee has done it again! This month's stamp release is just fabulous - beautiful designs, sentiments, fonts for every occasion! After surviving another cold and long Iowa winter, it was a huge joy to play with awesome and gorgeous images that made me dream of sunny weather! 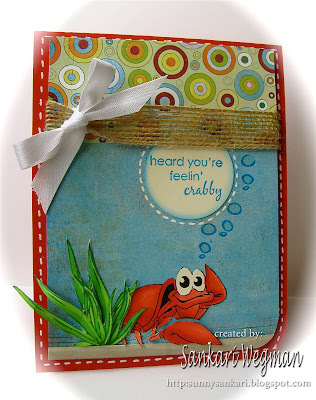 I created this card using the Happy Days stamp set and used the funtastic sketch from the Verve Beach Party Release Sketch challenge (VSAPRBP3). 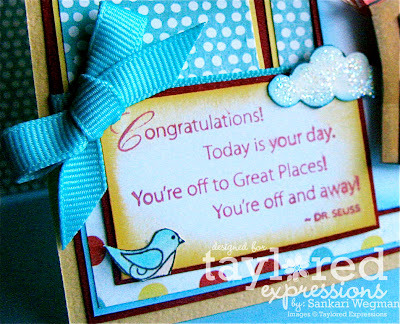 I am a huge fan of swirls and LOVE this swirly design that Julee has designed that you can stamp inside of among other things. 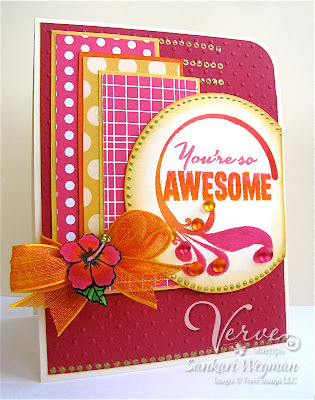 I stamped the swirly shape in shades of red, orange and pink and then the sentiment: "You're so Awesome" in the same color shades. I had to add some liquid pearls and finished it off by adhering the stamped flower onto the ribbon with glue dots. You are gonna love every single stamp in this set and in all the sets this release! 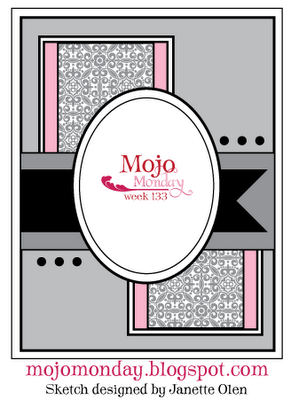 I really don't know how Julee creates these amazing designs each month! The release party is this Friday over here! But in the meantime check out the Verve Blog everyday for new samples of sneak peeks and play along with all of the Verve Beach Party challenges and you could win the whole release!!! 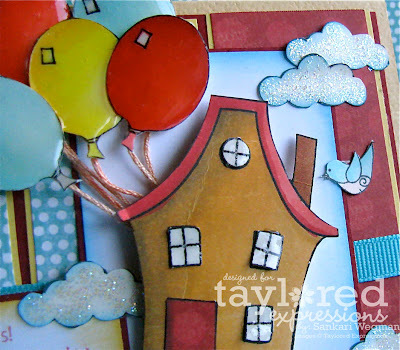 Taylored Expressions is hosting a blog hop today to showcase the new Crafter's Workshop Stencils now available at the Taylored Expressions store. Taylor has over 25 different stencils in the store (check them all out here) and there is such a different variety in how you can use these stencils - whether you chalk them up, emboss it, use it with the Copic Airbrushing system, use Maya Mist, sponge it, doodle with it, paper pierce them - there are so many different ways to use them! Hope you are having a fabulous day!! Have you peeked at all of the new yummy JustRite goodness that is being released today? JustRite stamps this morning is releasing its new stamps and this morning we are doing a little blog hop to celebrate by peeking these new and gorgeous stamps! One of my favorite new stamp sets is called "By the Sea" and has just lovely images and sentiments that you can interchange with each other. These oval stamps can either create an oval image in your card/creation - or you can cut out the stamped image and then place it in your card in any way you'd like. For my card today, I used the super sweet sketch from the lovely ladies over at 2 Sketches 4 You (flipped over Laura's Sketch #50). 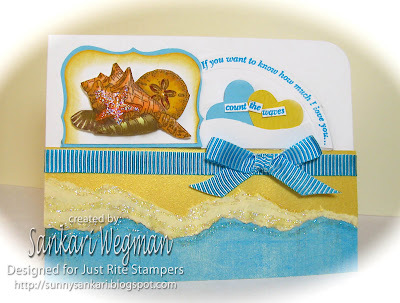 I love that little shape on the side and decided to stamp this super sweet image of these lovely seashells and create a CAS card that would have the a clean crisp lines of a walk on the beach at sunrise (oh, how I LONG for that!). I love this sentiment: "If you want to know how much I love you , count the waves." 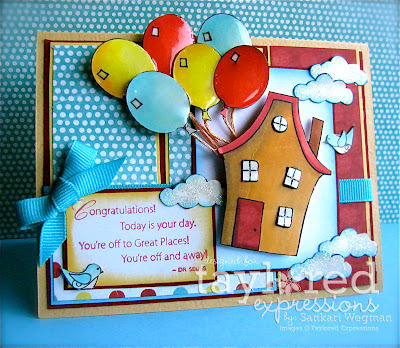 Gina K Previews and Blog Hop! I absolutely loved working with these darling stamp sets and can't wait to ink up all the images! They are so sweet! 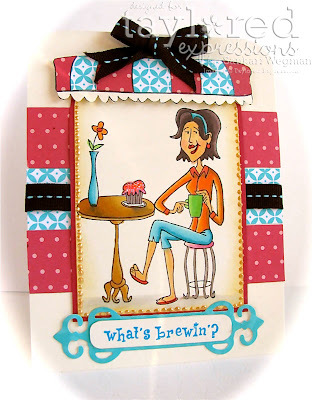 Tonight, we are having a blog hop which is featuring creations from among these stamp sets and I know that these ladies are going to blow you away with their gorgeous creations!!! The Release Party is this Thursday, April 22 on StampTV. There will be challenges, contest questions, chatter, as well as tons of samples from the Design Team members from 7-10 (central time) all leading to the new products being available in GinaK's online store at 10pm. We'd love to have you join us for our monthly party! Today is friday and every friday over at the Christmas Stampin' All Year Long blog, we have a different challenge ready to keep your holiday mojo going on all year long. 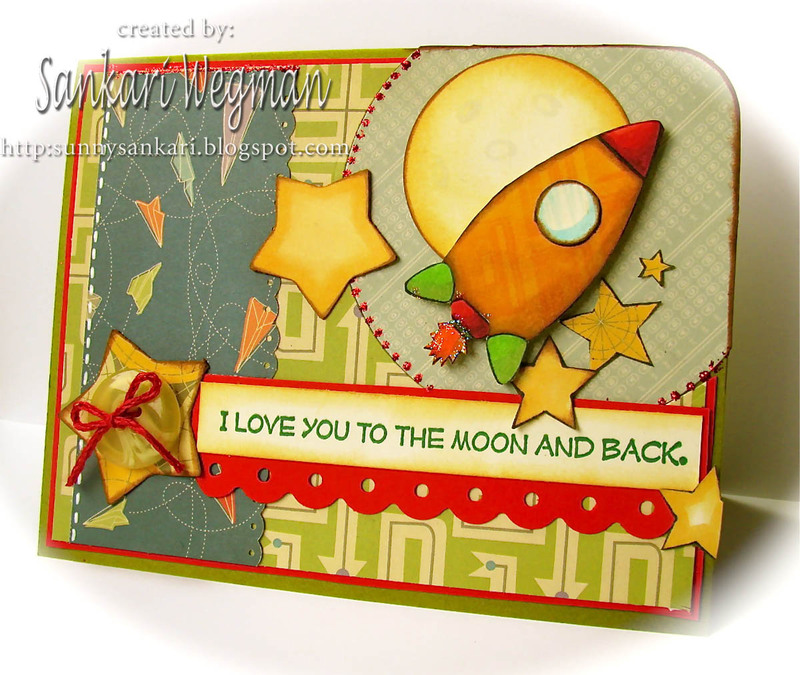 Today's challenge is to create cards that have die cuts on them (either from a kit or you can create your own die cuts with your cutting machine). I cut out circle in the center of my card with my nesties, so that my ornament could hang out in the center. I cut out a scallop shape with the center cut out to fit over the cut out circle and then adorned it with holly that I stamped, copified and cut out. I used the beautiful stamp set: Holly Jolly by Verve Stamps. 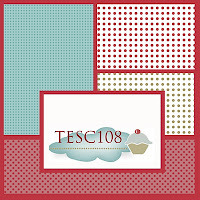 If you have a chance to play along, we would love to see your "to die for creations" - you can check out all the deets and all of the DT's creations over at the Christmas Stampin' All Year Long blog! Thanks so much for stopping by today! Hope your friday is off to a great start!!! Taylored Expressions April Key Ingredients are Here! In this month's Key Ingredients challenge - we wanted to do something other than A2 cards - any other shape and to also use any kind of sewing in our cards! Well, as soon as I saw these papers and the sewing challenge, I decided to make an early Mother's Day gift for my dear MIL who is an amazing amazing amazing seamstress (Its the sweetest thing to see the kidlets wearing Grandmas' creations :) So I decided to use this circular tin can to hold some cards that she can give away to people. 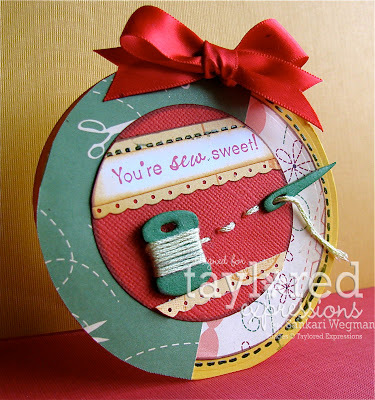 Here is the gift card holder: the circular tin can with the sentiment: "You warm my heart" from the Year of Sweet Sentiments stamp set from Taylored Expressions. Here is a picture of the tin opened (I created three circle cards (they are 4" circle cards and so will fit into an A2 size envelope). 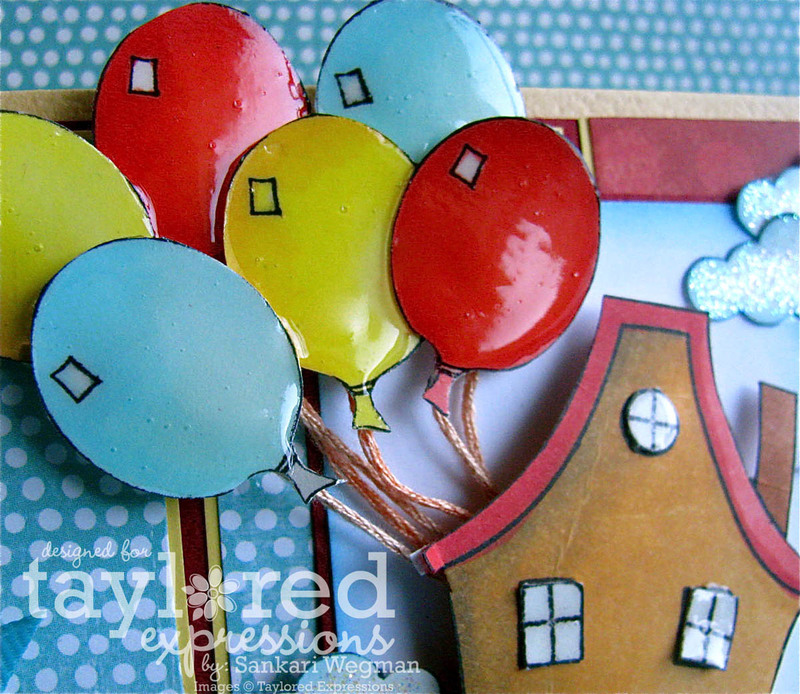 One of my FAVORITE ingredients in this month's kit is the sewing/themed chipboard! From needles, to thread, to dress holding mannequins - the chipboard in this set is BEYOND cute! I decided to keep the layout the same using the different Designer Papers for each of the cards. Here is a picture of all the cards. I used a safetey pin chipboard on the tin holder, a dress holder mannequin chipboard piece, a spool of thread/needle chipboard piece and a hanger chipboard piece. Here are some pictures of each card. 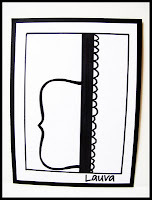 This first card has a dress holder mannequinwith the yummiest ribbon - isn't that meausrement tape for ribbon SO cute?! Love it! I added the sentiment: "Thank You" from the CreativiTEA stamp set from Taylored Expressions. 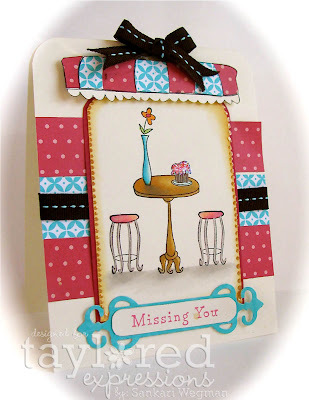 Here us a picture of the second card: I colored this little hanger and used some thread to "hang" the sentiment Missing You (from the Let's Do Coffee stamp set from Taylored Expressions.) off of the hanger. Here is the last card using a the chipboard spool of thread that comes with the Key Ingredients, around which I wound some embroidery thread and then I sewed a little bit and attached the sentiment: "You're Sew Sweet" from the Crafty Cuppie stamp set from Taylored Expressions. 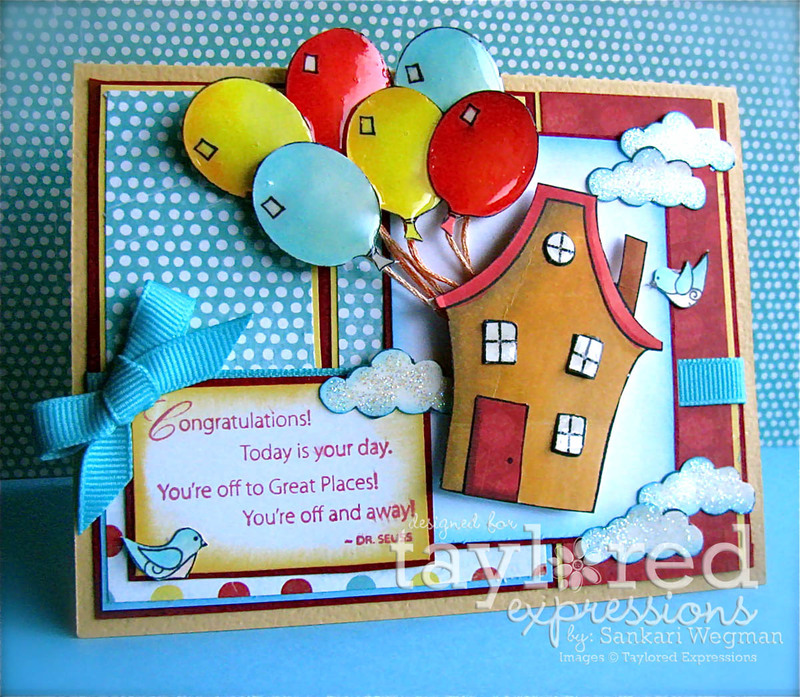 I loved these papers and I love all variety of the ingredients in this kit that really make it fun and easy to create cards. I can't wait to give this to my MIL and I can't wait to see all of the beautiful and amazing creations that my fellow Baker's Dozen Design Team Members have sewn up! Hop along with me!! 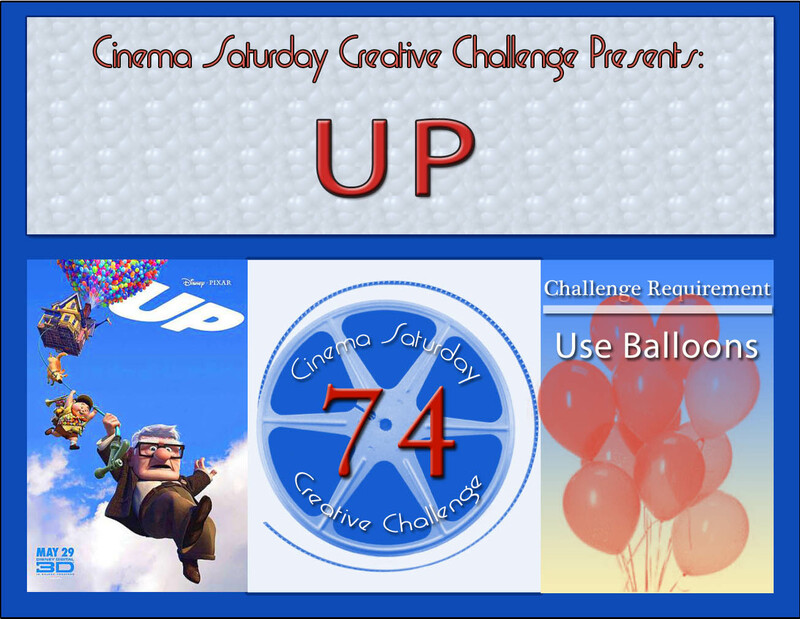 Cinema Saturday #74 - UP!! Every Saturday, over at the Cinema Saturday Creative Challenge blog, we feature a different movie from which we create a card, layout etc. inspired by some element in the movie. This week we are featuring the 2 time Oscar winning and "UPlifting" 2009 Pixar movie called UP. This movie also won 38 other awards (check out all of the wins and nominations here)!!! The beauty of this movie is that its not just for children, but really in a way - its for everyone. Children love this movie and the adults really embrace the heartfelt themes of life and love that are beautifully brought out in this movie! If you haven't seen it yet - you must - the animation, humor and sweetness will touch your hearts! 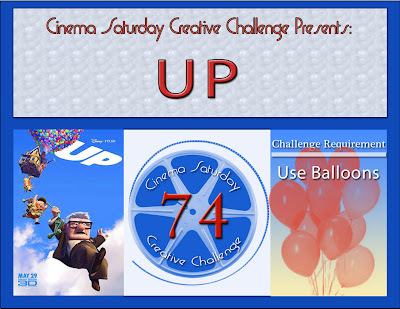 This week's challenge requirement is to use balloons in a way that was inspired by the movie. Here is a close up of the sentiment. I love this sentiment by Dr. Seus! It has so much spiriti of adventure in it! I LOVE how this card came out - I added a little glaze and some stickles to the card and called it a late late night...errr.. day :) Hop on over to the Taylored Expressions blog to see more details of this beautiful sketch and also hop on over to the Cinema Saturday Blog - we have three wonderful guest designers joining us this week, and you can see their gorgeous and inspiring samples and play along with us!!! I promise it will be fun to play along - putting balloons on anything makes it fun! Hope you have a beautiful weekend!! I am so glad to be part of this group of crafters and its been so much fun to create a little holiday magic all year long! Check out the Christmas Stampin All Year Long blog for more details of this challenge and to see all the yummy cards made for this challenge! Hope your Friday gets sweeter by the minute! Today is Release Day over at Taylored Expressions and it is HUGE!!! 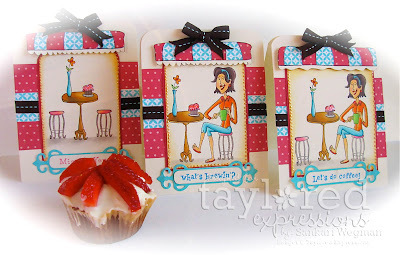 Today Taylor is releasing 4 full stamp sets, 1 mini set, 3 A La Carte Cuppie stamps and 3 new Card Kits!!! Getting inky just got more fun!! 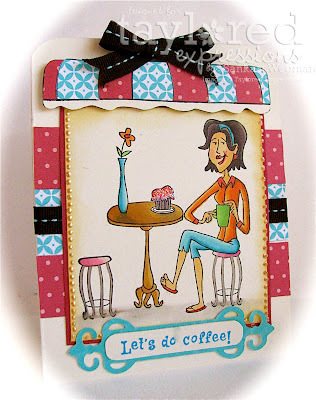 Today I am So excited to peek a new set from the Apple Doodle Ink Collection from Taylored Expressions featuring the super sweet cutie: Tena :) who is visiting a coffee shop in this stamp set called: Let's Do Coffee! To keep it simple, I kept the layout and colors all the same (the papers are from Cosmo Cricket and Martha Stewart). I love sweet Tena (her name is pronounced Tina, its just spelled TEna for TE or Taylored Expressions ;) isn't she cute! I stamped the table and then used a stamp-a-majig to stamp Tena so that her elbow rested on the table and then paired it up with the sentiment: "What's brewin?" I stamped the table and then used a stamp-a-majig for Tena and to stamp another stool and paired it up with the sentiment: "Let's do Coffee" (I am so excited to give this card to one of my dear friends with whom I used to have regular coffee dates - but recently we have been a bit busy so we haven't had our coffee dates... Love this sentiment! I can't wait to do some shopping! Stop by Taylored Expressions Store to see all the new items!!! These stamps are really just the cutest school/teacher images and I can't wait to give it to all of the special teachers and helpers who have made school such a wonderful and fun experience for my wee ones :) Speaking of not being able to wait! I can't wait to see the A++++++ creations of the design team for these stamp sets!!! Come on over and hop with me!!! Please stop by tomorrow for RELEASE DAY!!!! YAY!